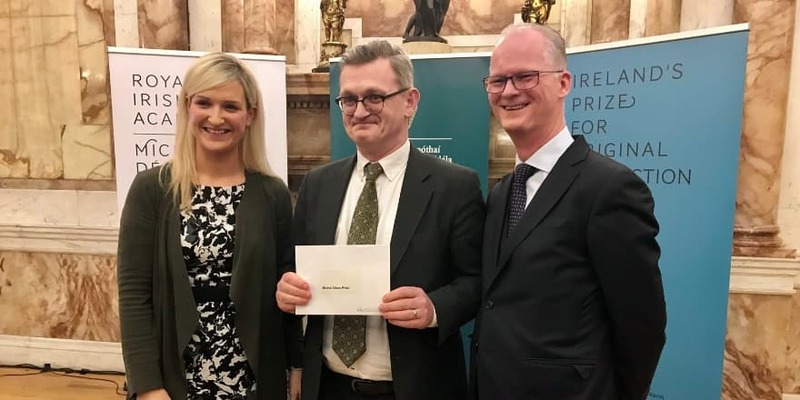 The Royal Irish Academy (RIA) last night at a ceremony in Iveagh House announced the winner of the inaugural Michel Déon Prize for non-fiction as Breandán Mac Suibhne for his book The End of Outrage: Post-Famine Adjustment in Rural Ireland (Oxford University Press). Breandán Mac Suibhne is a historian of modern Ireland (PhD, Carnegie Mellon) and is a fellow of the Moore Institute for the Humanities in the National University of Ireland, Galway. His publications include, with David Dickson, The Outer Edge of Ulster (2000), an annotated edition of the longest lower-class account of Ireland's Great Famine. He was born in the community that is the focus of The End of Outrage, making it a particularly intimate and absorbing history of a small place in a time of great change. The €10,000 prize for the winning author is funded by the Department of Foreign Affairs. Breandán will also get the opportunity to give ‘The Michel Déon Lecture’ in France in early 2019. Listen to a panel discussion with four Irish women writers to celebrate the 250th anniversary of the birth of Maria Edgeworth (1768–1849). The six shortlisted titles for the inaugural Michel Déon Prize for non-fiction has been announced today.